Gary Douglass, right, has moved his martial arts school, Tri-State TaeKwonDo, from Conant to Jos. Campau. 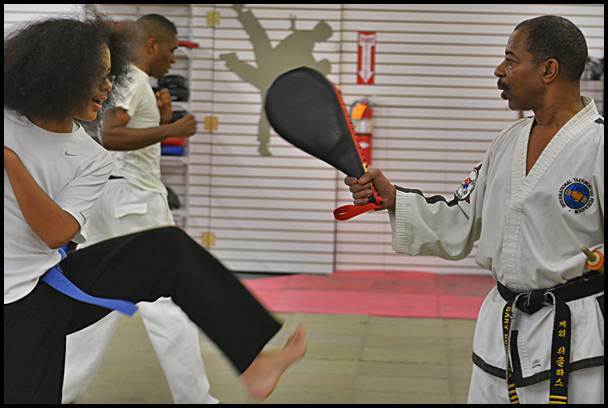 At 12 years old, Douglass, who is now 57, began training in martial arts. Having an interest in helping people gain confidence and learn self-defense, Douglass decided to teach martial arts. He initially taught at the Hamtramck Recreation Center for 12 years. After his hours were cut at the center, he opened a location on Conant. He recently moved and renovated his studio to Jos. Campau, just south of Caniff. Douglass has an average of about 30 students per class. Although he is the only instructor, he gets assistance to help children in his classes from eight of his students who have obtained a black belt, which is the highest belt color achievable in taekwondo. There are nine different levels of black belts, and Douglass is currently at the 6th degree. Douglass believes that it is “never too late to get started” in martial arts, and therefore he has a program that is suitable for all age groups. Every Saturday from noon to 1 p.m., Douglass holds the Little Ninjas program for 3-to-7 year olds. This program teaches children socialization skills and physical fitness, while being introduced to the fundamentals of martial arts, such as kicks, punches and the development of self-esteem. These techniques help students enter advanced levels of taekwondo. The studio also has martial arts for adults who are 18 to 80 years old. This program teaches adults to get into shape, improve coordination, increase flexibility, as well as gain self-reliance to know they have the skills to protect themselves. Douglass’ son, Gary Douglass II, 14, said he has enjoyed participating in several competitions. Douglass II began practicing martial arts with his father when he was 3 years old. He said not only does the training help him get “in shape and become flexible,” but the lessons he learns during practice benefits him in school as well. The lessons Douglass II is referring to are the five tenants of taekwondo that are stressed in the studio: courtesy, integrity, perseverance, self-control and indomitable spirit, which means to have a strong character and be unconquerable. Douglass said these are “life philosophies” that everyone should learn. Having trained with Douglass for approximately five years, Matthew Lopacki, 27, said the practice has made him a better person. Lopacki has a black belt and often helps teach the younger students during class. Taekwondo “is a new outlook on life itself because it lets you meditate and reflect on yourself, as well as everyone around you,” Lopacki said. Martial arts student, James-Michael Moore-Willis, 18, who is majoring in sports medicine at Macomb Community College, agrees with Lopacki in terms of becoming a better person. Moore-Willis began learning taekwondo at the age of 3, and started training with Douglass when he was 7 years old. Douglass said his ultimate goal is to develop his students’ competence in self-defense, discipline, fitness and social skills. Participation at the studio requires a monthly fee of $60, which is $5 per class. However, the cost of a class is $8 for students who are interested in taking lessons once a month. For the Little Ninjas program, the fee is $30 a month. For more information about Tri-State TaeKwon-Do, visit, http://tristatetaekwondo.com. Master Douglass, please remove all listing of USTF affiliation from any advertising as this is completely misleading and an example of poor integrity. Thank you sir.